I had a Facebook request for cake pops and since Easter is right around the corner, I decided to customized them just a bit. 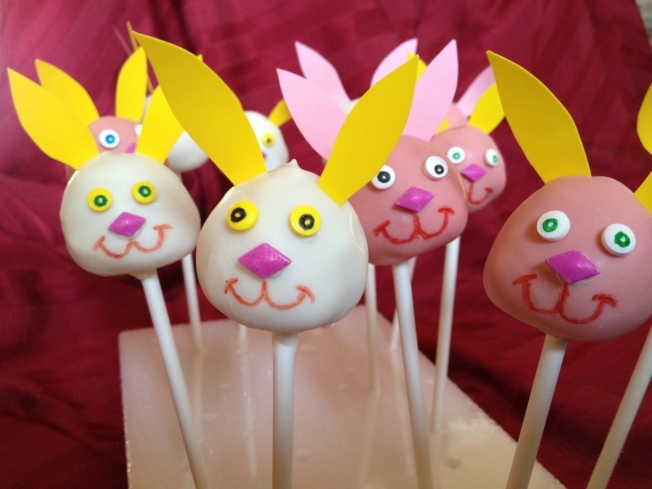 With simple ingredients and a few decorating techniques you can make colorful bunny shaped cake pops. They are a fun idea for Easter but they are also work for any occasion. Edible Ink Marker, color or colors that contrasts the candy melts (example: if using white candy melts, then use red or black marker). Piece of styrofoam to insert the pops so they dry standing up. Take the edible paper and cut it into 1 1/2" wide strips. Take each strip and cut a series of 1 1/2" tall "ears" that are wide in the middle and come to a point on one end. You'll need about 72-80. Keep the ears in a plastic bag until ready to use because they'll dry out. Prepare the cake mix in a 9"x13" baking pan according to the package instructions. Once baked, allow it to cool completely. Crumble the cake into a large bowl. Add the can of frosting and mix ingredients together thoroughly until fully blended. Scoop out about 1 1/2 tablespoons of the mixture and roll it into a ball. Place ball on a baking tray lined with parchment or wax paper. Repeat with the remaining mixture. You should get about 36-40 balls. Place the balls in the refrigerator for an hour. Meanwhile, melt about 1/3 of the candy melts from only one of the packages in a microwave. Heat the melts in small 15 second intervals until smooth. Remove the balls from the refrigerator. With each ball, take a cake pop stick and insert it about halfway into the ball. Remove the stick and swirl the end in the candy melt. Reinsert the coated end into the ball. Repeat with remaining balls. Place the balls in the freezer for about an hour. Working with groups of 12-13, remove the group from the freezer and let it sit at room temperature for about 20 minutes. Peel the plastic backing off of 24-26 "ears" and set them within reach of your work space. Take one bag of melts and microwave them in a heat proof container, per the instructions on the bag, until smooth. Be careful not to over heat the melts or they won't harden properly. Dip a pop into the melted mixture and slowly swirl to cover. Lift the pop and allow excess mixture to drip off before turning the pop upright and placing it into the styrofoam. Quickly place two ears into the top of the melted surface before it hardens. You might have to hold them in place for a few seconds before they firm up. Repeat this with the first group of pops and then continue on with the next group and a new bag of melts. Once you've complete each group, you can place them in the refrigerator until you're ready to decorate them. Before decorating, color a small donut shape inside of each of two candy rounds to form eyes. Using a dab of soften candy melt, glue the two eyes in place. Add a third round (or other small shape, like a diamond) centered between and just below the two eyes. Use the maker to create a curved "W" below this third piece with the center point of the "W" touching it. Add curved lines on the ends of the "W" to simulate a smile (this part is optional…you may like it without the smile). Repeat with the remaining pops. If you have any questions or comments, please send me an email at wayne@waynesweekend.com or follow me on twitter or Facebook.